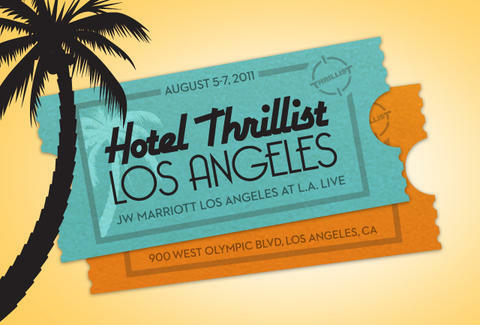 Here's your shot at attending the event of the Thrillenium: Hotel Thrillist Los Angeles, a 3-day, 2-night celebration of life, love, and the downfall of far lamer parties that only last one night and zero days. Because epic good times require an epic space, the long weekend will take place at JW Marriott Los Angeles at L.A. LIVE: a 54-story, Gensler-designed tower whose modest occupants include six world class restaurants run by everyone from Kerry Simon to Wolfgang Puck, the Nokia Theatre (home of the EMMYs and ESPYs), Trader Vic's (the most classic Polynesian drinks destination in the universe), and a little sports & entertainment venue called The STAPLES Center. While tenderly stroking the lap of luxury, you and your guest will engage in such activities as lavish cocktail parties, more lavish cocktail parties, a feast at the skyline-overlooking ION Rooftop Pool Bar featuring eats from restos including Katsuya and Fleming's Prime Steakhouse, and a daytime Hollywood Hills Mansion Pool Party. Your good times will be supported by luminous sponsors BACARDI® Arctic Grape™, NIVEA for Men, and smartwater®. For your chance to win, simply enter (and tell your friends to enter) once daily until July 15th -- one day after Bastille Day, yet another supposedly important celebration that has the Gaul to end after a paltry 24 hours. A room for 2 could be yours by entering at HotelThrillist.com once per day, 'til 7/15. Follow @HotelThrillist for winner announcements and itinerary updates Must be 21+ to enter. Please drink responsibly. Terms & Conditions.